If you didn’t know that The Gift was the vision of a single creator going in, the closing credits clear it up pretty quickly. 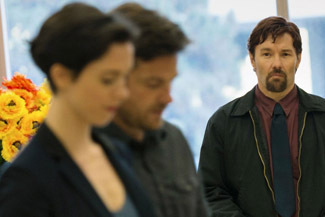 The new thriller was written, directed and produced by Joel Edgerton, who also stars as the film’s villain, a troubled loner named Gordo. As is often the case with films that emerge not by committee but by singular force, The Gift is a tougher film than most; it concludes in almost defiant fashion, daring the audience to try and find a way to feel. Simon (Jason Bateman) and Robyn (Rebecca Hall) relocate from Chicago to Los Angeles after Simon gets a big promotion. On move-in day, they run into Gordo, who went to high school with Simon; Simon doesn’t initially remember him, and when he does, he’s evasive on the details of their history. Quickly, though, Gordo starts showing up on the couple’s doorstep to leave presents — or invite himself in. Something is off about Gordo, in a way that makes the audience complicit in Simon’s judgment; he’s polite, he’s giving, he’s open — and yet, he’s identifiably creepy. Robyn, lonely and disengaged by life in their sprawling, (literally) glass house, wants to be kind to him, but Simon grows more put off by Gordo’s interest.